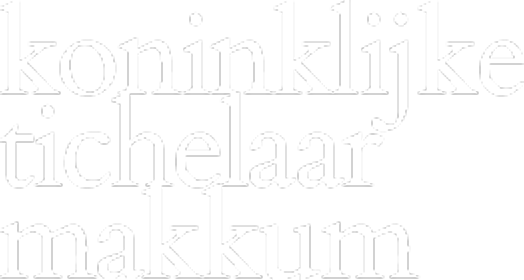 In accordance with the General data protection Regulation (AVG) Koninklijke Tichelaar B.V. (Tichelaar) has the obligation to indicate what personal information is collected through this website. This privacy statement is all about the personal data processed through this website and our newsletter. This statement is regularly adapted to organizational or political-legal developments. Therefore, see this with some frequency when you visit our website. Tichelaar offers you the possibility to register for the newsletter. This gives you permission to store the provided data. In this way Tichelaar can keep you informed of activities, news and / or developments. Tichelaar offers the possibility to unsubscribe at any time. If a newsletter is sent, statistics are collected based on the e-mail address. Our newsletters are sent to a specific area of ​​interest By keeping our statistics on e-mail address, we ensure that the content of the newsletter matches the interests of subscribers. Various forms of this website contain forms where personal data are requested. These personal data are stored in our CMS (on Dutch servers under Dutch jurisdiction) and are usually mailed to the specific department that has to process the data. The data of forms is only sent by e-mail to the department for which the data are relevant. For example, an information / contact request among our products only comes to the secretarial department. This is a mailbox that only people who are currently working in that function have access to. There is only a select number of employees that can use all form submissions for management purposes. The data is only used for follow-up of a contact request. In addition to the data you enter yourself, the time, the IP address and the relevant page are stored. • Forms and newsletter registrations For forms on pages within tichelaar.nl and tichelaar.com that are submitted, these are stored by our CMS. These are always on servers that are managed by us or by parties that we work with. These servers are in the Netherlands and are under Dutch jurisdiction. This information is for our own purposes and is not sent outside the Netherlands (now or in the future). Transport of this information always happens over a secure connection. This storage is generally valid indefinitely. • Statistics To collect statistics, we use the anonymized version of Google Analytics. These statistics do not contain any personal or demographic data. Tichelaar has signed a processor agreement with Google for the processing of data. The option to share data with other services (including Google's services) is disabled. Transport of this information always happens over a secure connection. The storage of this data is in the hands of Google and is done in the EU or US under US jurisdiction. This storage is generally valid indefinitely. • to inspect the data we have about you and you can have these corrected or removed in many * cases. • withdraw your consent to certain processing (such as sending a newsletter). * we are obliged to keep certain details of you. For example, contact details of our active customers. From the point of view of security, we are also forced to make backups. We check this for accuracy. It is therefore not possible to have your data removed from backups afterwards because they are no longer correct. • If you refuse to give your contact information, this will affect how we can reach you.